But the extent to which Rhode Island politicians are willing to turn their heads to General Dynamics’ rapaciousness and the moral bankruptcy of the company’s leadership took on a new dimension this week, when it was widely publicized that GD holds a lucrative contract to track detained immigrant children separated from their parents under Donald Trump’s deplorable immigration policy. Raimondo, Whitehouse, Reed, Langevin, and Cicilline have all spoken out forcefully against Trump and the scenes of children locked in cages after being taken from their parents’ arms, yet none have said a word about their corporate master benefiting from the president’s despicable and widely condemned family separation policy. It says something about their political courage, or lack thereof. It makes one wonder: If Trump is so worthy of criticism, why not also call out an opportunistic company that for years has seen our arbitrary and unfair immigration system as a means to a quick buck? Will corporate influence always override principal with these people? One political candidate, Matt Brown, the Democratic challenger to Raimondo, took a different stance, calling on his opponent to donate campaign cash she’s received from General Dynamics. This would be more than $12,000 since Raimondo got into politics and more than $11,000 since she became governor. By comparison, her predecessor, Lincoln Chafee, got just $425 from the company during his one term as governor. Raimondo’s acceptance of General Dynamics largess, by the way, only scratches the surface when it comes to the company’s buying off of influential politicians in Rhode Island. Indeed, if Raimondo, Whitehouse, Reed, Langevin, and Cicilline were to follow Brown’s recommendation and donate all General Dynamics contributions to the Refugee and Immigrant Center for Education and Legal Services, that’d amount to a $393,000 windfall for the worthy organization. Yet, even though Brown’s statement was courageous for its breaking from the usual silly glorification of a Fortune 100 corporate predator, there were also hints within it to the extent Rhode Islanders have come to normalize a company that’s main business is in death, destruction, and imperialism. 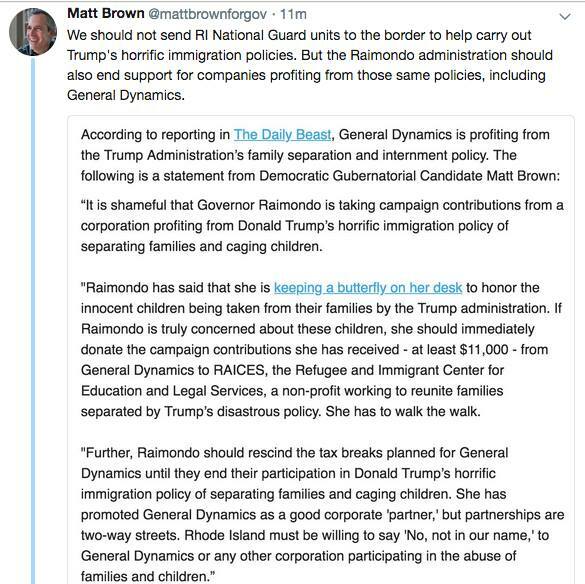 Consider the fact that Brown specified Raimondo should rescind her recently announced $34-million subsidy package to General Dynamics-Electric Boat “until” the company ends its complicity in tearing immigrant children from the arms of their parents. My guess is Brown’s intent was to focus on the more salient and timely aspects of General Dynamics’ moral degeneracy. After all, the former Rhode Island secretary of state and founder of an anti-nuclear weapons organization has spoken out forcefully against General Dynamics’ other business practices. But it is important that people not see the current outrage over GD’s involvement in Trump’s immigration crackdown as an isolated incident. It’s not an aberration, some temporary moral slip made by an otherwise upstanding corporate citizen. For proof, you need not look any further than the company’s own messaging, exemplified in its annual reports, which read like passages from the pen of George Orwell himself. While GD at one moment claims what “unites” its employees is the five “Ethos” principles—including honesty, trust, and “humanity”—these documents are filled with surreal and euphemistic language that sanitizes killing and presents human slaughter as just another reasonable cost of doing business. Modernizing and increasing lethality here being translatable to: killing more people, more efficiently. In addition to producing arms and ammunition, and having a “market-leading position in light armored vehicles” and tanks that offer a “proven edge in combat,” General Dynamics says it has active contracts in international markets, including “Kuwait, Morocco and Saudi Arabia.” That last country, of course, is leading an assault on Yemen, with U.S. support, that’s involved air bombings, blockades of food and essential medical supplies, and the perpetuation of famine and a cholera outbreak. “America’s stalwart M1 Abrams, used in nearly every major U.S. conflict since its inception in 1980, serves as the main battle tank of the Army and Marines. At close to 70 tons, the mighty Abrams tank is among the heaviest in the world, but it makes up for its weight with terrifying firepower and impressive maneuverability. The estimated cost of associated equipment, training and logistical support is $1.15 billion. The principal contractor will be General Dynamics Land Systems in Sterling Heights, Michigan. At the most recent General Dynamics-Electric Boat keel-laying May 11, Jim Langevin commented that “Hundreds of jobs are going to be added here over the years as we ramp up the building of the Columbia class,” according to WPRI, alluding at the end to the next generation of nuclear-armed submarines to be built at an estimated cost to taxpayers of $104-billion—a figure virtually guaranteed to rise. On Twitter, Jack Reed gushed that he was “proud” and “pleased” with the Navy’s “newest high-tech” submarines. I suggest they—in addition to Raimondo and their fellow delegation members—stop the self-delusion, acknowledge the truth about the company they’re shamelessly lauding, and take a truly moral stance that’s not undermined by contradiction, convenient oversights, and willful denial.